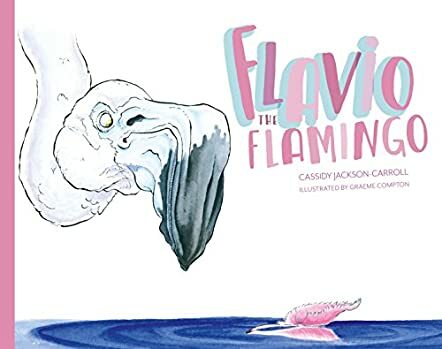 Flavio the Flamingo by Cassidy Jackson-Carroll opens with Flavio the Flamingo having lost his pink color and he wants it back. He thinks that if he does not regain his color, he is going to be non-existent. Flavio goes to Zeke the Zebra and Zeke says he can only see black and white stripes. Flavio then goes to Gigi the Giraffe and she says she can only see patchwork and things of great height, and not the color pink. Mela the Meerkat thinks she is too small and short to see it. Leki the Leopard and Hilti the Hippo are unable to help Flavio find his color. Flavio is lost and sad and is filled with a feeling of emptiness which he cannot stand anymore. Will he be able to get his favorite color back? I like how the author handles the topic of identity crisis and how Flavio finally feels at home after finding what he is looking for. The illustrations are well executed and the pictures link the concept nicely with the words, enabling young readers to understand it well. It is a good book for story time as many children will be able to understand the feelings of Flavio the Flamingo and his dilemma. I like these kinds of stories that speak about a concept, a message or a thought because these are helpful to children in comprehending emotions like acceptance, belonging, and being alone to find out what they really want. Children are introduced to various wild animals, thereby enhancing their knowledge about animals and their appearances. I like the attitude of Flavio the Flamingo, who does not give up until he finds what he is looking for!